The envelop included in this product was previously opened for display. What more could you ask for? 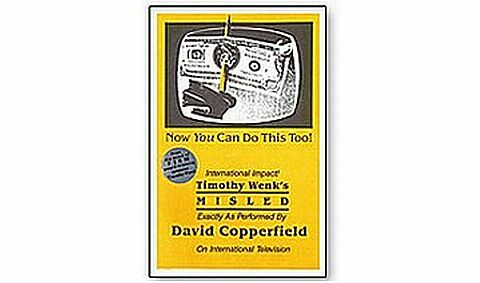 Misled was created by FISM '91 award-winning inventor Timothy Wenk and performed exactly as described in this booklet by David Copperfield on international television! A $100 bill and (possibly if you happen to be working in an office!!!) a pencil are borrowed from a member of the audience. The borrowed bill may be marked for later identification if desired.You proceed to use the pencil to pierce a hole in the center of the bill-there's no doubt that the pencil is truly through the bill. Watch the audience gasp (especially the bill's owner) at what happens next...you rip the pencil through the bill-the audience clearly sees the pencil rip through and they can hear the sound of paper ripping! Yet, somehow the bill is left completely unharmed!You offer to repeat the effect, this time the pencil mysteriously melts through the bill in slow motion-it looks unbelievable! Both the pencil and the bill may then be handed out for complete examination.